The iPhone has quickly become the go-to digital camera for many of us, storing thousands of memories and moments in images. But if you lose an iPhone, it becomes broken, or succumbs to water, you may be left with a situation where all you have is an iPhone backup file and no direct access to the photos. The good news is, as long as you have regular backups made of your iPhone, you can probably recover the photos. The possible bad news is you’ll need to have a recent backup made if you want to get all your pictures back, this is yet another reason why it’s absolutely essential to make regular iPhone backups, preferably both to iCloud and to a computer using iTunes. 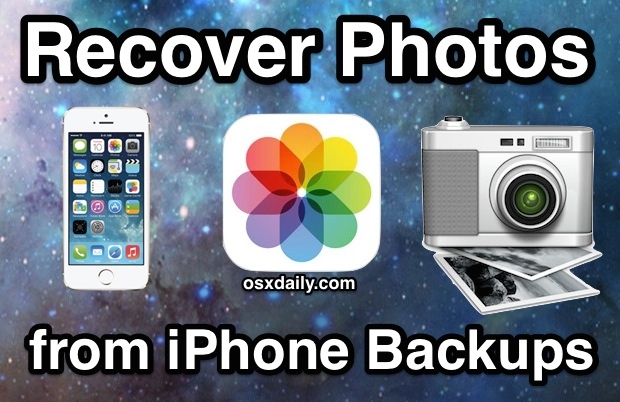 Assuming you have an iPhone backup handy, you can recover the photos from that backup. We’ll cover two ways to do this, one is a manual method of using the backup from iTunes or iCloud to restore to an iPhone, and the other approach uses a third party app that can extract photos directly from an iPhone backup file left on your computer as made through iTunes. So long as you have backups handy, either approach will work, but you’ll need to use whichever approach is most appropriate for your situation. For example, if you have another iPhone handy or just got a new iPhone to replace a missing one, use the traditional restore method, whereas if you only have a backup file with no phone, you’ll need to use the third party app solution. The recovered images will be the exact images in full resolution as taken from the iPhone. The simplest way to recover pictures from an iPhone backup is to actually restore another iPhone (or your own iPhone) from the most recent backup made. Of course this relies on you actually backing up your photos, but unless you went out of your way to not do so, you probably did. If you don’t have your own iPhone handy to restore to, you can even do this with a friend or family members iPhone – just be sure to back that device up first so you can restore their stuff, otherwise they will not be happy – and then use the traditional methods to get the pictures over to a computer where you can access them. Easy, works for both Mac and Windows PC’s, but yes it requires access to another iPhone. 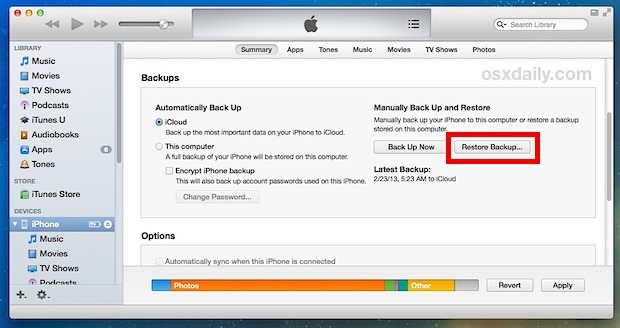 This is super simple, just restore the iPhone from the backup, whether it’s from iCloud or iTunes on the computer. Again, if you’re doing this with someone else’s iPhone – BACK IT UP FIRST! – otherwise they will lose whatever is on their device. When the device restoration is finished, you can now copy the pictures from the iPhone to a computer so that you have your photos again. If you used someone else’s device for this purpose, don’t forget to restore it to their own backup when finished. If you don’t have another iPhone handy and you’re only working with an iPhone Backup File created from iTunes, you’re going to need to extract the photos from the actual backup file stored on the computer. This can be done through a complicated database extraction process similar to retrieving text messages, but a better solution is to use a super easy third party app. The best app we’ve found for photo recovery is called Picturescue, it’s not free, but you can download a trial version which will scan your iPhone backup files and determine whether or not there are any pictures available to extract, offering a preview of the images and providing a photo total count. If you’re happy with what you see from the backup file, you’ll need to shell out the $10 to buy the app, but considering photos are often priceless, that’s a small price to pay. Using Picturescue is extremely simple, just download the app onto the computer that holds the iOS backup files (i.e., what computer was used to sync the iPhone with iTunes) then launch it. Picturescue will instantly scan the backups available upon launch and show a date and thumbnail previews of all the images found, offering a number of the total amount of pictures that can be pulled from the backup file, in this screenshot image there are over 7000(!) pictures found in the backup file alone! 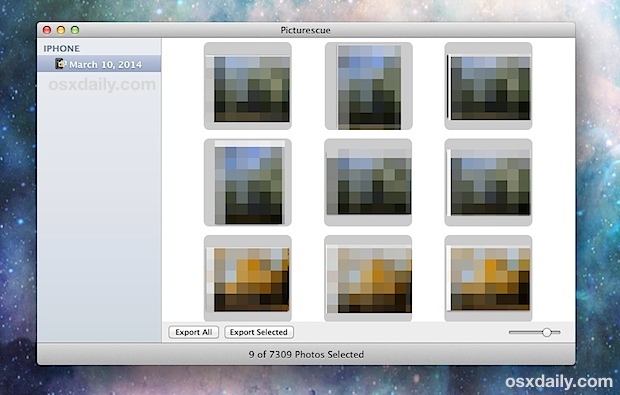 You can either select images and manually extract the ones you want based on the thumbnails, or better yet, just choose the “Extract All” option to copy every single photo from the backup and into a folder on the Mac where you’ll have direct file access to all of the pictures and images. Picturescue works with any version of Mac OS X that is 10.6 or newer, and works flawlessly with Mavericks. Once called “Photo Rescue”, it was renamed for whatever reason, and the apps recovery function is actually not limited to the iPhone, so if you’re looking to pull images from an iPod touch or iPad that works too. The only significant limitations to Picturescue are that it can’t work with encrypted iTunes backups (that’s a good thing for security purposes though), and perhaps worse, is that it’s Mac only. If you know of a good Windows equivalent app to restore your iPhone photos from a backup file in a similarly easy manner, let us know in the comments! How about auto upload to Dropbox, google drive, or one drive. This seems over complicated. Great idea! Now I have TWO places where half the photos need to be weeded out and deleted. For those a little more careful, this is a good alternative. Better would be Time Machine. I downloaded and tried the product and although I back up everything maniacally, the app showed only backups from 2013 and one from 2014- a few days ago. Importing into iPhoto has been my default method for a long time. Of course not everyone has a Mac (unfortunately), so that’s not an option for everyone. If you don’t like iPhoto, Image Capture is also an option. Image Capture is rarely ever mentioned anywhere, but it’s a great app for importing photos, or scanning. It has been with OS X since the beginning. Its much easier just to drag the back up file into iPhoto. All your pictures will be imported. Really? Does that work? Do you drag the iTunes Media backup file to iPhoto or what? That would be a great solution to know of! Does anyone know of a way to recover other things from a backup file? I lost my keyboard shortcuts when I went from iOS 7 to 8. Over the years I had accumulated alot… all gone. The reason I lost them is partially my fault, but mostly Apple’s. I upgraded from 7 to 8 OK, but my old 4S performed very poorly (most likely the size of the OS). So I tried to downgrade back to 7, and that didn’t work 100%, so I was forced to go to 8 anyway. During the day-long process, one of the processes could not read from iCloud and I lost (at least) my shortcuts. I may have lost other things, but the one I miss everyday is shortcuts. I made “erase all content and settings” to my iphone6 then I restored data from icloud from another iphone4! Unfortunately I recognized that I didn’t backup my pictures on my iphone6 and they were lost ! Is there any possibility to restore my pictures from iphone6? So I recently deleted all my photos off my iOS 7 iPhone 4 so they can now all live in the photo stream. Due to certain issues I tried to recover them by restoring my back up before I deleted off my phone. They did not return and I am stuck with all my photos on the photo stream. Is there any way to still put them back on my iPhone still? Do I have to disable my photo stream before restoring my iPhone for in order for it to put those photos back on my phone? Will this work with any apple product? Ipod, Ipad? hi there! my ipad was disabled last year, luckily my cousin enabled it but runs as a new ipad, i lost everything. so i started using the ipad as a new device. just recently, i connected my ipad to itunes, i accidentally clicked “restore”. my ipad restored to its pre- disabled state.and i lost everything, no buck ups were made. i want my pictures back. is there a way to retrieve those files, i tried using dr fone, jihosoft etc but it cannot find the pictures im looking for..please i need your help. is there a way to just acess the ipads memory and recover all data that were not bucked up? thanks! Unfortunately it is not possible to restore a backup of one’s own phone onto someone else’s. You can only restore any backups of a specific phone onto itself. I lost a load of photos of my kids today when updating to iOS9 and have no way to retrieve them (restoring my backup doesn’t retrieve the photos for some reason). I am devastated. I tried using an old iphone but itunes doesn’t give me the option to restore my saved backup from my current phone onto this old one. Picturescue is USELESS wasted 10$… it cannot recover the backup that is encrypted. The backup is encrypted nn, what do you expect? You have to enter the password to unlock the encryption. Do you think Picturescue is KGB with quantum computing encryption cracking? Well sorry but it’s not, you need to enter your encrypted backup password. If you encrypted a backup to protect it, it’s encrypted, that’s the point. “Wake up” hahhahah thanks for the laugh. that was some good stuff.